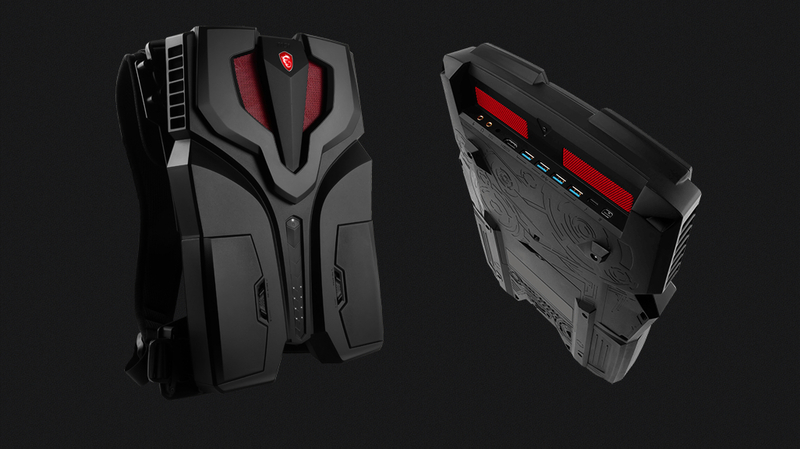 We've previously reported on MSI's VR backpack, then a concept that we weren't convinced would make it any further. Turns out it has, and the Taiwanese company has just shown off the finished product. Why put VR on a backpack? One of the biggest drawbacks of the top-tier VR headsets - Oculus Rift, HTC Vive, PSVR - is that they have to be powered by a beefy machine, keeping them tethered at all times. By putting that power on your back, you'd be able to take advantage of room-scaling technology without worrying about any pesky cables. The new version of MSI's backpack, made specifically for the HTC Vive, has a slightly different design to the one we'd seen prior, and comes with a new name: MSI VR One. It weighs 3.6kg and will be able to deliver about an hour and a half of VR fun powered by a Nvidia GTX 1 graphics card. There's also a HDMI port, a mini DisplayPort, Thunderbolt3, and plenty of vents to keep it cool. Sure, you'll look a bit silly using it, but at least you'll also have your 'Crap Ghostbuster' outfit sorted for next Halloween. MSI says it worked closely with HTC's Vive team to bring the backpack to life. It also brags that it's the "lightest and thinnest backpack PC system", although competition isn't huge. HP and Alienware are among a handful of others to also announce similar products, but the VR backpack market is hardly a thriving one. Yet.